On Sunday Island FM and Trim Dog welcomed nearly 50 dogs and their owners to the Annual Charity Dog Walk. Starting from Liberation Monument at 9.30am on a glorious day all enjoyed the short stroll together to Bulwer Avenue and back. A registration fee of £5 was collected to support Animal Aid and the GSPCA with the totals raised to be released soon. There were goodie bags and certificates for each doggie as well as a raffle for the walkers with prizes of up to £100 of Trim Dog vouchers handed out. 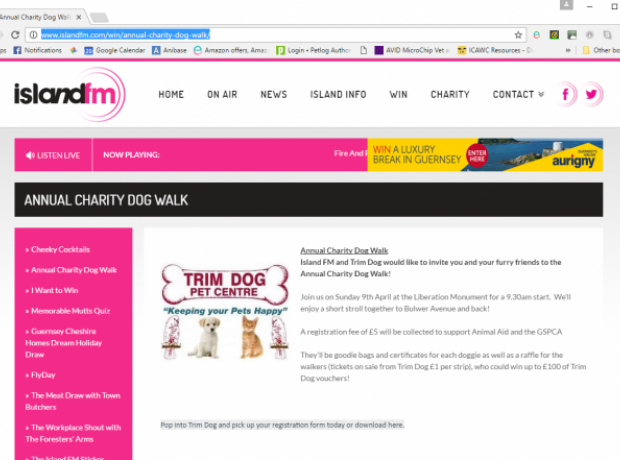 Island FM and Trim Dog would like to invite you and your furry friends to the Annual Charity Dog Walk! Join us on Sunday 9th April at the Liberation Monument for a 9.30am start. They’ll be goodie bags and certificates for each doggie as well as a raffle for the walkers (tickets on sale from Trim Dog £1 per strip), who could win up to £100 of Trim Dog vouchers!